As long as people have been selling cars, they’ve also been knowing what they have. This isn’t just an internet-age problem, either. Sellers know more than you, and have done for a very long time. 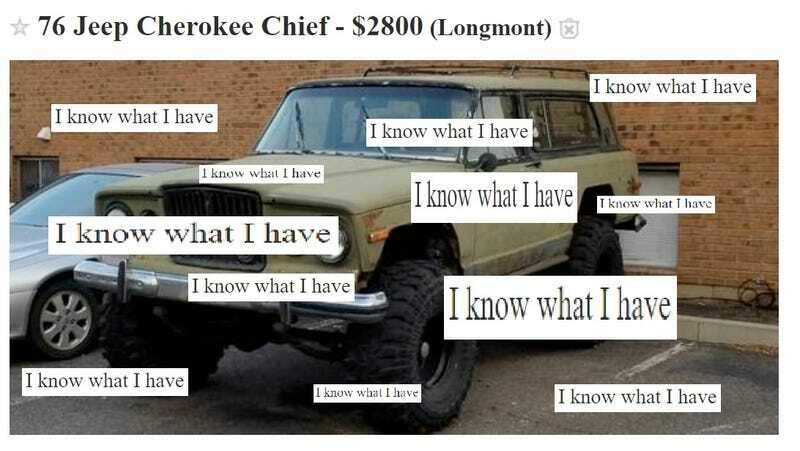 If you’re going to low-ball them, don’t even bother calling, because their ratty and rusty old Jeep is VERY RARE. If you’ve been looking to get connected with a seller who seriously knows what they have, then you should definitely be following the automated twitter account @IKnowWhatIHave1. Like this seller with a ran-when-parked 1960 International cargo van. This seller definitely knows that they have a 1973 El Camino with a busted transmission. This ad for a crashed and rusty Monte Carlo with no title? Oh, they definitely know what they have. While Twitter could certainly do with fewer bots, this is the kind of mindless entertainment the platform was invented for. While the algorithm picks up on any nationwide ad with those infamous words in that order, not all of the listings are for cars, of course, so you’ll have to do a bit of wading through to find the four-wheeled goodness. It’s worth it for a good laugh. At $3,700, Would You Take This 1986 Nissan Maxima To The Max?